At age 17, Brodax joined the army for World War II, and was awarded a Purple Heart for his own injuries, but also a Combat Medical Badge for treating fellow soldiers while under fire. After returning home and going to college, he was hired by Hollywood’s William Morris Agency, where he worked in the program development department. There, he helped develop Sid Caesar’s Your Show of Shows (1950-1954), ranked #37 on TV Guide’s 60 Best Series of All Time. In 1960 he moved to King Features Syndicate to head their new film and television development department: they had just bought the rights to Popeye cartoons. 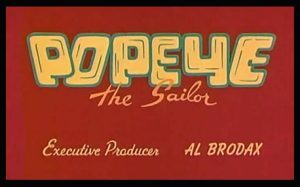 Brodax wrote and produced more than 500 cartoon episodes — not just Popeye, but also Krazy Kat, Beetle Bailey, Casper the Friendly Ghost, Barney Google, and others. Then, when he saw The Beatles perform on The Ed Sullivan Show, he approached them to suggest a cartoon series featuring the Fab Four. That was approved, and 39 episodes were made, debuting in 1965. He then co-wrote and helped produce a feature film with the British band: the animated fantasy Yellow Submarine. Brodax later was the animation supervisor for ABC in the 1970s, and a consultant for Marvel Comics in the 1980s. He died November 24, at 90.